Most of us here in Southwestern Ontario prefer the warmer months. But when the snow falls it’s nice to still be able to enjoy your outdoor landscape, even from indoors. Visual interest in winter doesn’t have to come just from urns, wreaths, and garland that gets taken down shortly after Christmas. Hardscaping and plants provide cold-weather beauty that lasts the all season long. Below, we explore various landscaping options whose function and good looks extend well past our patio-dwelling days. Conifers are typically top of mind when a landscaper wants to add year-round life to a garden because most keep their foliage throughout the cold months. They come in a wide range of sizes, shapes and shades of green that will compliment any home’s exterior. Some of the more popular conifers in our region are from the pine, spruce, and fir groups. And while they come from a different conifer family, cedars, cypress, and junipers, with their splayed branches, aromatic wood, and interesting bark, are also very popular. But there’s more to evergreens than just needles and cones. Other conifer families are broad-leafed and/or fruit-bearing. These shrubs tend to have an appearance that more closely resembles a deciduous plant, but they don’t shed their leaves. Beautiful examples of broadleaf evergreens that thrive in the hardiness zones of Southwestern Ontario are Euonymous, Boxwood, and the festive favourite, Holly. Beyond conifers, there are many trees and plants that brown or lose their leaves every year that can add structure and interest to the outdoors. Ornamental grasses are a great example of plants that turn brow but maintain their structure through the winter and make a lovely, wispy addition to a winter landscape. Purple Coneflower, Black-Eyed Susan, Hydrangea, and Autumn Joy Sedum shed their foliage but maintain flower stalks and/or seed heads that look beautiful under a blanket of snow. Mountain Ash, Canadian Serviceberry, and Winterberry (a popular Holly variety) are great choices for adding pops of colour to your winter landscape. Tip: Holly berries will only form if male and female plants are established together, so be sure to purchase one of each to avoid disappointment. Many trees offer visual interest with noteworthy texture or colour. Birch trees have a white, papery bark whose beauty is revealed after it sheds its canopy of leaves in the fall. Stems and twigs can provide bursts of colour ranging from bright green to orange and red. In our region Dogwoods are a common shrub that add vivid colour against the white snow. And a funny-looking tree with a funnier name – Harry Lauder’s Walking Stick – adds twisty, highly textural support for freshly fallen snow. Don’t discount stone structures and fixed furniture as difference makers where visual interest is concerned. These hardscaping elements can add colour and texture to otherwise flat terrain. Besides enhancing the beauty of your outdoor space, landscaping and hardscaping can also play more functional roles. 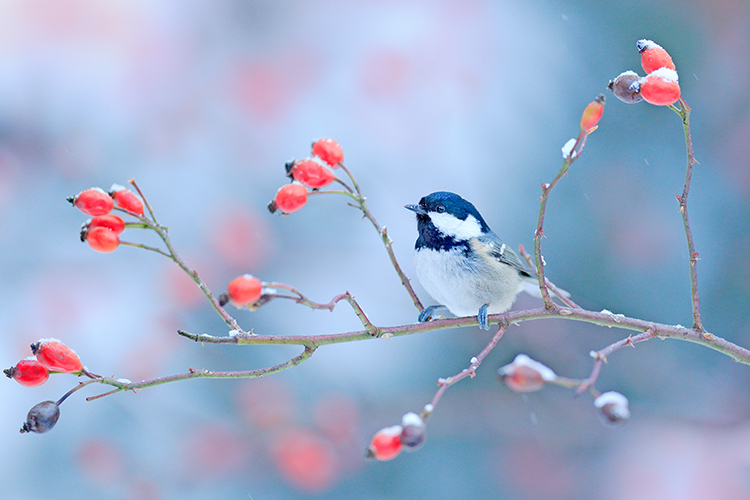 Trees and shrubs bearing berries or situated close to suet and seed will provide nourishment for birds including Juncos, Cardinals, Blue Jays, Nuthatches, Chickadees, Finches, Woodpeckers, Doves, and Sparrows. Dense, mature evergreens can also offer ideal shelter. A properly situated row of evergreens ensures year-round privacy and can also act as a windbreak and natural snow fence, sheltering your yard from cold winds and drifting snow. Outdoor lights aren’t just for the holidays. White mini lights can define the shape of a small tree or shrub. Consider lighting natural and hard elements with floodlights or projection lamps for a different but equally beautiful aesthetic at night. Adding visual interest to outdoor spaces increases the appeal, value, and enjoyment of your home. As long as you’re selecting plants and varieties that are appropriate for your hardiness zone, your landscaping can help beautify your home not just in the warmer months, but throughout the year. In Southwestern Ontario, we’re generally finishing up putting our lawns and gardens to bed for the winter. While some do very little but cut back spent seed heads and dead foliage, others employ measures to cover and protect every tree, shrub, and plant on their property. An approach that falls somewhere in between is generally best to avoid plant and tree loss and ensure a healthy start the following spring. Here are some guidelines to help you ensure you’re adequately protecting your lawn and garden in the winter. Getting your lawn winter-ready takes very little effort. In fact, you may already be doing most of the items on this short checklist already. Grass generally stops growing after day time highs remain below 10°C. Your final cut of the season should be between two and two and a half inches. Grass that’s too long may fall over through the winter, encouraging fungal growth. Grass that’s too short leaves it susceptible to stress due to the cold. Remove all furniture, toys, and debris (including any notable accumulation of leaves) from your lawn to avoid damage that results in bare patches come springtime. Dormant grass that doesn’t yet have a good layer of snow on it yet can be damaged quite easily when walked on. Try to stay off of grass during this transition. A blanket of snow serves to insulate your lawn during the winter. Once the snow flies and starts to accumulate, keep your lawn blanketed all winter long. If a location is exposed to excess wind, snow melt, and/or ice, the vegetation in that area may break or even die before or by the time spring arrives. In addition, if relatively horizontal limbs are suddenly laden with heavy snow or ice, they might bend or even break as a result. 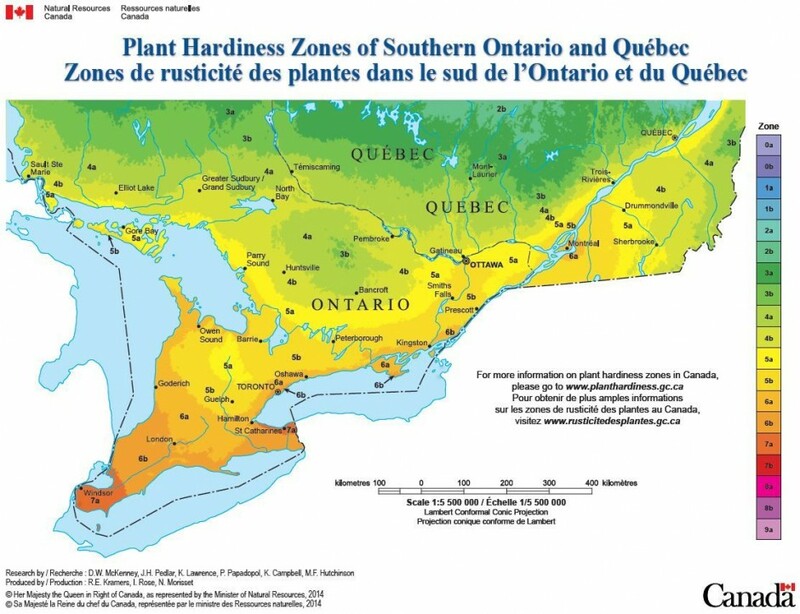 Our region (Stratford and surrounding area) is generally classed as hardiness zone 5, so your garden should consist of plants and trees that thrive in this zone. If you’ve tried to push the limit with some of your selections (vegetation that’s appropriate for warmer hardiness zones), you’ll need to take special care to prepare them for winter in Southwestern Ontario. 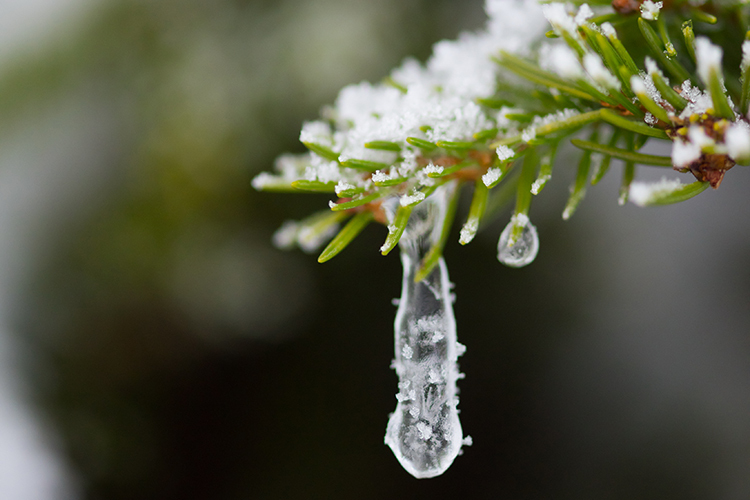 Well-established plants and trees have strong root systems that help sustain them through the cold winter months. On the other hand, those that have been newly planted or moved, particularly after the beginning of September, have not had sufficient opportunity to get established and so will require protection this winter. If your plants do need to be protected, there are three primary methods used, depending on the plants in questions and what you’re needing protection from. Wrapping with burlap and twine can protect shrubs from salt spray, drying winds, and/or heavy snow and ice. You might opt to protect younger evergreens and shrubs from frost and heavy snow with a teepee instead, which can be made out of burlap and wood stakes or plywood. A 4 to 6-inch layer of mulch on vulnerable or newly established plants will protect them from the effects of repeated freezing and thawing which can plague our region this time of year. This is simply the act of piling soil up around the base of a plant, and is a great way to protect plants and bushes that are cut back at the end of every season. Mounding is commonly done with rose bushes and hydrangeas, as it protects them from exposure to prolonged cold, ensuring a healthy plant, come spring time. If you haven’t taken measures to protect your garden yet, an early layer of snow may have you feeling like you’ve missed the boat. However, most vulnerable plants will still benefit greatly from protection, so it’s not too late. Regardless of how long winter is, you can still use the tips above to avoid plant loss and help guarantee a beautiful start to next year’s growing season. Learning how to properly prune trees and shrubs is an essential skill that will help keep them healthy and beautiful. Below, we’re going to share some pruning basics, discussing not only how to prune but also when. Pruning Shears: Can be held with a single hand and spring-loaded to return to open position for your next cut. These are ideal for roses, vines, and shrubs. Loppers: There are a few different types of loppers, but they all have thicker blades and longer handles than pruning shears, and generally require two hands for operation. Loppers are capable of cutting branches up to 2 ½ inches thick, and are typically used to trim trees and vines. Pruning Saws: When loppers won’t do the trick, reach for a pruning saw. While there are many different styles, most can cut through branches up to 5 inches thick. Hedge Shears: These are great for trimming and shaping hedges, evergreens, and shrubs. While the branches this tool generally encounters are thin, it can get through up to a 2-inch thickness. Pole Pruner: Pruning trees and shrubs from a distance can be challenging and require this special tool. Reaching 8 feet or more, and able to cut through over branches up to 1 ½ inches thick, a pole pruner eliminates the need for a ladder, making it not only handy to have, but safe as well. It’s imperative that tools are well maintained. This means cleaning and sharpening blades on a regular basis. Tools should be cleaned after each use. A wipe-down with a rag is usually enough to clear the blades of debris. If you’re pruning a diseased tree, be sure to add alcohol to your rag before wiping the blades down. If you start to notice your blades aren’t cutting as cleanly and efficiently as they used to, you can use a mill file to sharpen the blades’ bevels while securing it in a vise. If you don’t feel up to the task, having your blades professionally sharpened every year or so is also an option. Proper pruning of flower-bearing and fruit-bearing trees and shrubs can help them produce more flowers and fruit in future cycles. If you’re pruning to get rid of disease, cut back all dead and diseased branches, ensuring to take a bit of healthy growth beyond what you want to eliminate to ensure you get all of it. Then you can trim additional growth as needed to achieve the desired shape. If you’re pruning to reduce bulk and restore a nice shape to your tree or shrub, try to cut on a slight angle, about a half inch above a bud or branch that is growing in the desired direction. 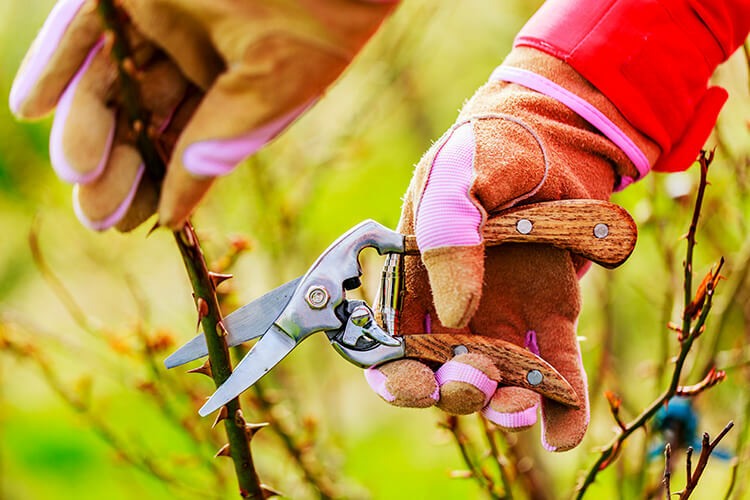 Although over pruning will not destroy your tree or shrub, try to avoid being heavy-handed with pruning measures, as doing so would impede new growth the following season. The guidelines around when to prune are fairly simple. For trees that bloom in the spring, like Lilac, Forsythia, and Rhododendron, it’s best to prune them as soon as the last flowers of the season fade. New growth begins on these trees after they’re done flowering, in the same season, so if you wait to prune until later in the growing season you’ll reduce flowering the following spring. For summer blooming trees, resist the urge to prune in the fall. These shrubs don’t generate the new growth that flowers will grow from until spring time, so are best cut back after they go dormant in the winter or even early spring the following year. For decorative and privacy hedges, like the popular Boxwood, trim back new growth regularly through the growing season, stopping about 6 weeks before the first frost. It’s best to keep the top a bit narrower than the bottom to avoid shading the lower branches from much needed sunlight. While the subject of pruning tools and techniques can get more complex, depending on your hardiness zone and the plant species in question, the basic pruning advice above will help you keep your trees and shrubs healthy, happy, and looking good, year after year. If you find that maintaining your gardens requires more time and effort than you can spare, contact us at A Touch of Dutch Landscaping to discuss your maintenance needs.